4. When did you start to embroider? I started to get serious about embroidery with cross stitch designs from Teresa Wentzler. In 2005, I went to Paris to visit the needlework fair, L´aguille en fête. It was at this fair that I first saw all the techniques that I am learning. The needlework at display and demonstrated during the fair imprinted in my head, and created a desire for me to create them myself. 5. How did you learn? I am mostly self-taught, reading instructions from books and from the internet. But I also took instructions from a few teachers. This portrait of Svea combines silk-thread sketching with Asian laidwork. Vincent expresses some dissatisfaction with his execution of Svea’s hair, caused by his color-blindness. I think he’s being a bit hypercritical of his work! 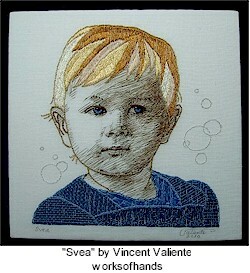 Learn more about Vincent and see more of his stitching on his blog. And thank you, Meri, for alerting us to this remarkable talent! What a beautiful keepsake this would be!